Lindsey Pulliam goes up for a contested layup. The freshman guard was the second-highest scoring player for the Wildcats in their loss to Ohio State. 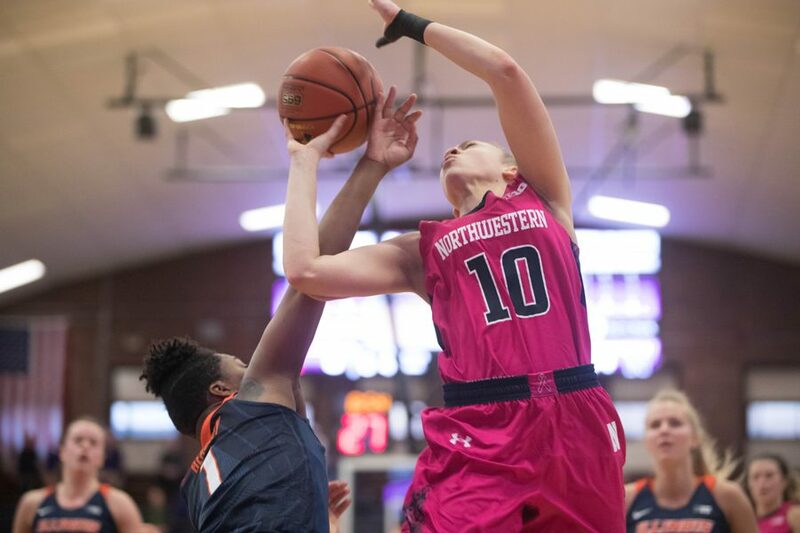 In Northwestern’s second-to-last game of the regular season, NU left its home court behind and headed to Columbus to take on No. 14 Ohio State. Walking in, the Cats knew they were in for a tough night, given that the Buckeyes currently sit at the top of the Big Ten. Ohio State blitzed the Wildcats (10-19, 3-12 Big Ten) early, coming out with 28 points in the first quarter and 22 points in the second to take a 22-point lead into the half. It was easily looking like a 100-point game for the Buckeyes (23-6, 12-3), but NU marginally held them back in the second half, losing 88-54. Although the team wasn’t able to grab a win, junior forward Pallas Kunaiyi-Akpanah said she saw a lot of good play and thinks the team learned an important lesson. Slowing down Ohio State’s offense is a hard feat; the Buckeyes lead the Big Ten in scoring. The Cats were somewhat successful offensively in the first half but also weren’t able to match the hosts. At the end of the first quarter, NU trailed 28-13. Before halftime, the gap widened even further to 50-28. Coach Joe McKeown said the two opponents had very different goals going into the game, but in the third quarter, he saw a switch flip in the Cats. In the third, NU and Ohio State looked like comparable opponents. The Cats kept the Buckeyes to 16 points in the frame and scored 14 points of their own — with major contributions coming from Kunaiyi-Akpanah, who scored 10 herself in the period. Kunaiyi-Akpanah finished the game with a team-high 23 points. Ultimately, though, NU wasn’t able to turn the game around in their favor, snagging just 12 fourth-quarter points. A piece of the losing puzzle was the Buckeyes’ depth. Seniors and juniors make up the entirety of Ohio State’s starting lineup, and senior guard Kelsey Mitchell garnered the Buckeyes 22 points. Cats freshman guard Lindsey Pulliam said they know what they have to improve on for the last game of the season against Rutgers on Sunday.